Over the past year, I’ve managed to get my scraps into this single laundry basket. It’s about 18 inches square and 11 inches tall. It fits nicely under my fabric shelves. As you can see it’s rather full – but I can’t bring myself to toss out usable fabric. So, this week, instead of doing any number of other things around the house which need to be done, I’ve been working on my scraps. I follow Bonnie Hunter’s Scrap User’s System with some variation. I’ve got shoe boxes on my shelves with squares, bricks, strips and strings. I’ve even been known to pull pieces from these boxes for quilts I’m making. My goal is to clear the laundry basket — some day — but more importantly not add to it. 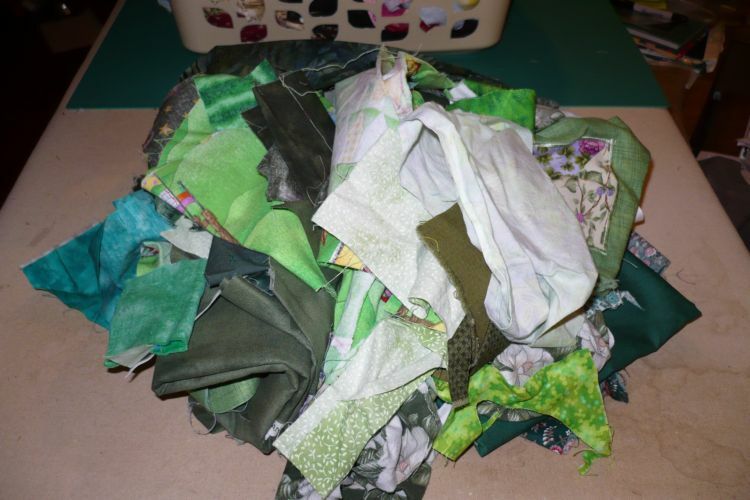 So, moving forward whenever I finish a project I’m going to cut up my scraps if they are smaller than a fat eighth. This week I’ve pulled a couple of handfuls of fabric out of the basket and cut it up, but I could hardly tell looking at the scrap basket. So, tonight I pulled most of the green out of the basket. I won’t call it all, because I didn’t do a complete search. There could still be some hidden in the middle. I’m curious to see how many pieces I can get out of this. When I get this pile done, it will be back to something more pressing I’m sure.